Liam Chawke Electrical are authorised dealers for GEL Water Softeners. GEL have been manufacturing innovative water treatment products in Italy since 1979 and are now recognised as one of the leading water treatment suppliers in Europe. A basic water softener system comprises a holding tank, pre-filter, timer and controller that removes calcium, magnesium, and certain other metals from hard water. The resulting soft water is more useable with soap and detergents, clothes feel softer, showers feel more luxurious and limescale does not form in kettles or appliances. Soft water also allows the heating system to function at maximum efficiency by preventing scale build-up in radiators while prolonging the life of the overall plumbing system. Water softening is usually achieved using lime softening salts or ion-exchange resins. The Decalux water softeners from GEL are equipped with the ET 500 electronic timer and control regeneration by time, while models with the VT 1000 and VT 2000 electronic timers, control regeneration by a combination of time, volume, volume/time. The AD version of GEL water softeners are fitted with a resins disinfection system and a salt alarm device, checking the salt level after each regeneration and eventually indicating when salt is exhausted. Water softeners come in varying sizes and the model of water softener is chosen according to the hardness of the water to be treated and the estimated daily water consumption. If the daily consumption value is not known, it will be necessary to know the size and number of people living in or using the house or building. Once identified, the model of softener and the timer is chosen by considering the volume/time to optimise water and salt consumption. 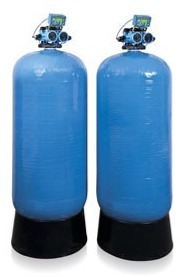 For a typical family or household with more than 3 people, we recommend Duplex water softeners which are made of fibreglass and available in standard two column configuration. They are equipped with the GEL VT2000 electronic timer and control regeneration by volume and volume/time. The AD version of the GEL water softener is fitted with the resin disinfection system and the salt level alarm device, checking the salt level after each regeneration and eventually indicating when salt is running low. 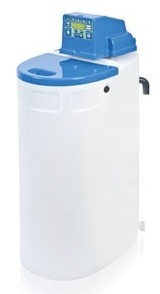 We also offer single and duplex water softener systems using the ultra reliable Clack controller if required. The main benefit of GEL Duplex softeners is to supply a non-stop supply of softened water 24 hours a day, since the VT2000 timer controls the alternate regeneration of each vessel, keeping one vessel in stand-by ready to replace the operating one, as soon as the operating one has exhausted its exchange capacity. GEL Duplex softeners can also handle high peak flow rates as the timer analyses the high water volume required and is able to make both vessels operate at the same time when required. As soon as the demand is back to normal values, the system will be operate under normal conditions with just one vessel. We provide a Free initial consultation and site visit in the Midwest region to help customers decide which water softener system is best for their home. Contact Liam Chawke Electrical & Water Pumps at 069-64318 for more information and to arrange the Free consultation.